Having trouble? Most issues that Crafthub.me users experience can be solved easily by following this checklist! Are CraftHub.me and Etsy Connected? CraftHub.me needs to be able to "talk" to your Etsy store. To check if CraftHub.me and your Etsy store are connected, go first to your CraftHub.me account. On your Etsy tab, make sure that your Etsy store is listed and set to "on." Next, log in to Etsy. Go to the "Your Account" drop down menu and select "Apps." CraftHub.me should be listed under "Apps You Use." If it is not, you have to reauthorize your account.You can do this by clicking on the "Re Authorize" button on your Etsy tab. Are my Product Listings Active? CraftHub.me will only send active products. To check if your product listings are active, go to your CraftHub.me "Products" tab. All active products will be set to "on." To change a listing's status, simply click the button to the right of the product. Does my Product Listing have a Media Attachment? 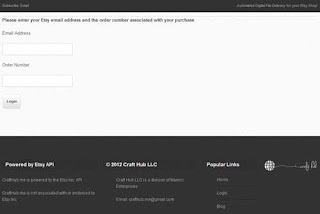 CraftHub.me only sends an email to your customer if your product has an attached media file. If one of your listings fails to send, check that it has an associated media file. Open the listing in your Products tab by clicking on it. Media files that are associated with this listing will show as "on." All other files will show as "off." Make sure that all appropriate media files are selected to "on." Note: You can associate multiple media files with a single product listing if you want, however you must have at least one file associated with the listing in order for it to send. Are my File Names Computer Friendly? If you have trouble with a particular file, check it's name. Remove any special characters. For more information on preparing your files, see A Guide To Starting Your Digital Business on Etsy and About .Zip Files. Go to your Content tab. In the Email Body field you will see this code, [%files%]. This code is very important. It tells the notification email to contain a link to your files. If you remove this code, your customer will still receive the notification email, but it wont contain a link to your files. You can use the Email Body field to add a note to your customers. You can even use HTML to add a custom picture, such as your Etsy banner to your email notifications. Be careful not to remove the code [%files%]. If you remove it by accident, just type it back in after your message. What if the Problem is on my Customer's End? Sometimes the issue may be on your customer's side. You can check if a notification email was sent to your customer by going to the Reports tab. Here you can see the date and time the notification was sent and the email address to which it was sent. The email address will be the one associated with your customer's Etsy account. If your customer does not receive their download notification, ask them to check their spam folder and verify their email address. You can also resend a download message or send them a link that goes directly to their download landing page. If you put a link to this page in your "message to buyer" box they will be able to access their download, even if they can't find their notification e-mail. You can also put the link in your shop policies, on your listings and even in your shop announcement. You can edit your "Message to Buyer" by logging in to etsy and clicking on the "Your Shop" link at the top of the page. The box that you will need to edit is at the bottom of the page, it's called "Message to Buyers". Your customer will need to enter the e-mail address associated with their Etsy account and their "Order ID#". They can the correct e-mail address by logging into Etsy and going to "Your Account" -> "Settings" -> "Emails". Your "Order ID#" can be found on your customer's purchase confirmation email as well as by going to "Your Account" -> "Purchases". Locate the order and click on the link that says "View Receipt". Once the page loads you can find the "Order ID#" at the top of the page.